In this short talk, Malcolm Dando looks at the challenges of ensuring the potential of modern biotechnology is used for peaceful purposes and does not become a new weapon of war. He discusses briefly the history of biological and chemical weapons from the first world war onwards. He focuses on the importance of the 1975 Biological and Toxin Weapons Convention (BTWC) and 1995 Chemical Weapons Convention today. He discusses the role of national legislation, internatioinal action and individual responsibility. For individual researchers in this area it is crucial that they are aware of their responsibilities and are vigilant about the implications of the work they do. The huge revolution of biotechnology also offers unwelcome opportunities for a wider range of people to develop new weapons. This requires better education for scientists about these issues and the challenges if poses for openness in science. He also discusses the issues around DIY biology and bioterrorism . Dando, M.R. (2006) Bioterror and Biowarfare: A Beginners Guide. Oneworld, Oxford. Wheelis, M., Rozsa, L. and Dando, M.R. (Eds.) (2006) Deadly Cultures: Bioweapons Since 1945. Harvard University Press, Harvard. Kelle, A., Nixdorff, K. and Dando, M.R. (2012) Preventing a Biochemical Arms Race. Stanford University Press, Stanford. 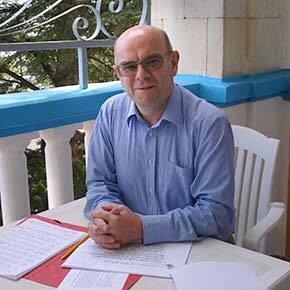 Malcolm Dando is Professor of International Security in the Department of Peace Studies at the University of Bradford. He trained originally as a biologist and after a period in Operational Research joined the Department of Peace Studies in 1979. In Bradford he has worked on issues of arms control, first concentrating on nuclear arms control and then, since 1991, increasingly on biological arms control. Most recently, his work has focussed on education and awareness raising amongst life scientists. He is co-director of the department's project on strengthening the Biological and Toxin Weapons Convention. He has published widely on biological warfare, bio-terrorism, non-lethal weapons and related international security issues. He is a fellow of the Institute of Biology. He has also spent time as the International Institute for Strategic Studies Senior Fellow at the Center for Global Security Research in Lawrence Livermore National Laboratory in California. His publications include The New Biological Weapons (Lynne Rienner, 2001) and Preventing Biological Warfare (Palgrave, 2002). If you want to arrange for follow-up discussions for a class with Malcolm Dando via the internet – over Skype or some other service - please contact him.